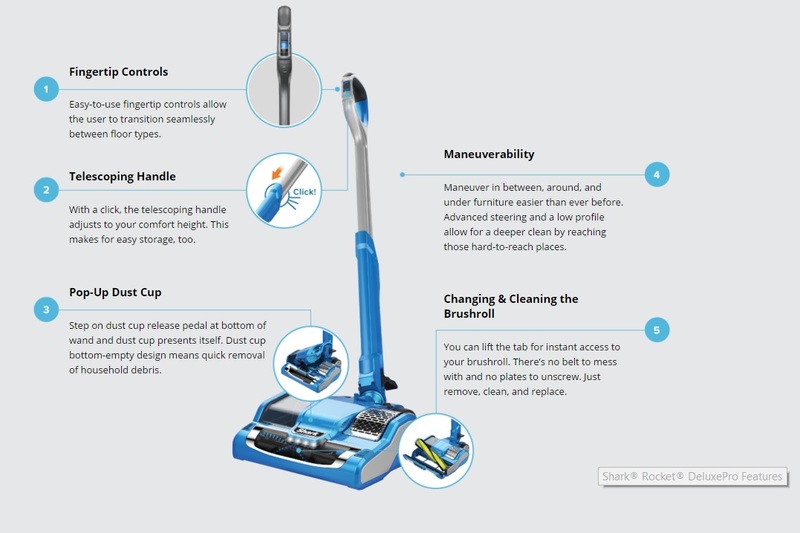 I am not sure if you have seen the infomercial for the Shark Rocket PowerHead but it has some great features; The PowerHead has powerful deep carpet cleaning, comparable to some of the biggest upright vacuums, with nearly half the weight. It also features fingertip controls on the handle providing a seamless transition from hard floors to carpet and back. Innovative product features such as a pop-up dust-cup with a quick release foot pedal and easy dust cup emptying with the push of a button. The PowerHead also is the first of its kind “car hood” style brush roll access with removable and rinsable brush rolls making vacuum maintenance quick and easy. The adjustable telescoping wand helps to customize the wand to your comfort and allows for easy storage. 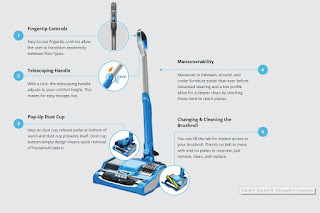 This model also comes with an additional Gentle Touch Hard Floor brush roll for enhanced hard floor cleaning and an optional on-board brush roll holster to attach to the wand of the vacuum for easy brush roll exchange. My Opinion: I really like how light this vacuum is and it took me 10 minutes to put together as I could not understand how to put the brush roller cup on but after that was placed I was off and running. I have very thin carpets, thrown rugs and hardwood flooring I did not change the roller so I could see how the hardwood floor roller would work and it worked like a breeze and same for the carpet roller on all my floors. I am in love with this and it is so easy to empty the dust bucket as well.